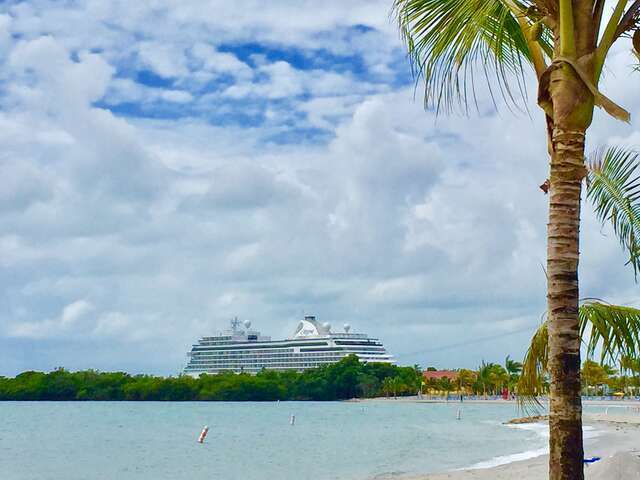 If you've never taken a cruise before, you're not too late to the party. There's never been a better time to try a cruise. Cruise travel never stops innovating, launching spectacular new ships and new ways for cruise travelers to interact with ever-more intriguing ports of call. Worried you might not fit in among experienced cruise travelers? Here's a guide to all the most important terms you'll need to sail through your first (no doubt of many) trips at sea. Beginning with your first question: Where am I? Let's first get one thing straight. It's a Ship. Not a boat. Nothing makes you look like a newbie more than referring to your ship as a 'boat'. Generally speaking, a boat is small enough to be carried aboard a ship, but a ship can't be carried aboard a boat. A British Navy witticism is 'A ship, gentlemen, is what we are in, a boat is what the gravy comes in'. Tenders. These are the small boats you see carried on the sides of your ship. They are lifeboats in the highly unlikely event of evacuation. But more likely, a tender is how you'll get to shore if you have a 'tender port'. Some Ports of Call - that is, stops on your cruise - don't have docks big enough for your ship, or they're all in use. So your ship anchors off shore, and guests are shuttled back and forth to shore in the ship's tenders. They usually go back and forth all day. They are not luxurious, but comfortable, and have a full roof to protect you from the elements. Before we leave the word 'tender'… Shortly after you board, everyone – that means everyone – on the ship stops what they're doing and participates in a 'Muster Drill' or safety drill. It's the maritime version of the safety instructions you experience prior to an aircraft take off. Depending on the cruise line, you 'muster' or 'assemble' at your assigned tender or a different designated 'muster station' or 'assembly station'. This is the part of your holiday where you take responsibility for your own well-being and make sure you know where your muster station is, and you and your loved ones know the drill. OK, you've boarded your ship. One of the first places you'll head is your… Not 'room'. Cruise travelers inhabit 'Staterooms'. And if you're lucky to sail in an exclusive area of the ship, or even an all-suites ship, your Suite. You often hear – and your travel advisor may even refer to - 'cabins'. Back in the day of strong class distinctions, cabins were very basic. First-class cabins with much better amenities were called staterooms. These days, even the least expensive accommodations would be considered staterooms, so many long-time cruise experts always say stateroom, not cabin. If there are multiple rooms (other than a bathroom) in your accommodations – think: walk-in closet/dressing room, or a separate living space - it's a suite. Inside staterooms do not have a wall on the outer wall of the ship. There are no windows (although some newer ships have created 'virtual' windows/ views for inside staterooms). 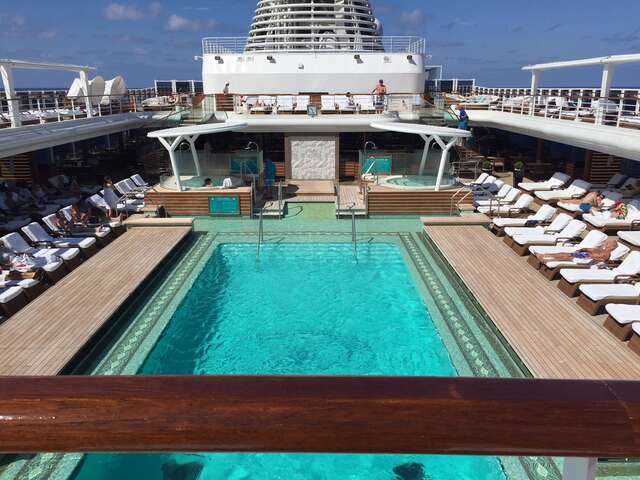 Ocean-view staterooms are on outside walls of the ship. But the port-hole or window that looks outside may not open. Balcony or veranda staterooms have doors/windows that actually open for you to access the open air/ outdoors from your stateroom. Ships are also directional. Whether they're in Port or at Sea (those terms are pretty self-explanatory) there's a pointy end facing forward and a blunt end bringing up the rear. On a cruise ship, you refer to the pointy direction as 'Forward', never 'front'. And instead of saying the 'back' it's called 'Aft'. 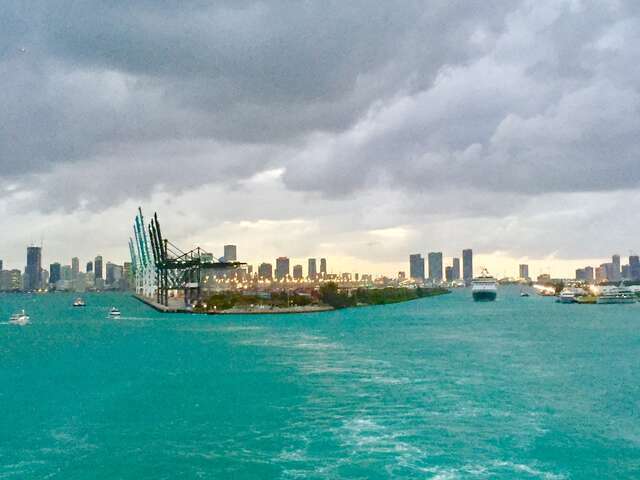 (The spectacular view from an aft suite on sailaway from Miami). Between Forward and Aft, you're 'Midship'. This makes finding your way around your ship quite straight forward (pun intended!) 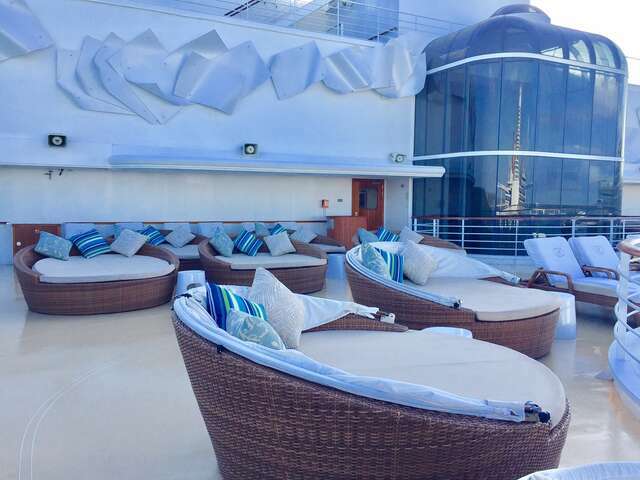 If your new friends tell you to meet them at the bar on Deck 10 Aft, well, you know exactly where they'll be. Tell them to order cocktails for you; you'll find your way there before the ice starts melting. Modern ships are very helpful in way-finding. Elevator lobbies and hallways post a simple drawing map of your ship so you can see where you are relative to forward and aft. So you know not just what deck you're on, you also know which way to head forward, aft, or midship to your destination. Your destination on the ship, that is. Navigation of the ship itself from port to port takes place from the Bridge on an ocean ship, or, on a smaller river cruise ship, the Wheelhouse. Many cruise lines offer tours of the bridge or wheelhouse if you're interested in seeing where the navigation action happens. 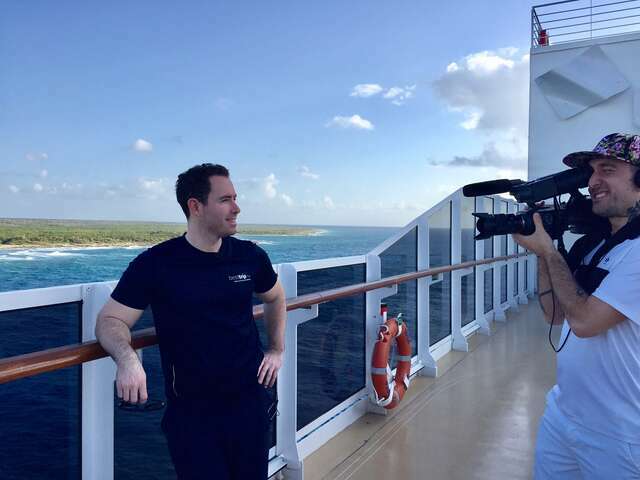 We've been lucky enough to be filming on the bridge of a huge ship when multiple officers are docking her – what a feat! Your food is prepared in a Galley, not a 'kitchen'. Think about it, even bread has to be baked on board for freshness. Food and beverage services on ships are an enormous, multi-restaurant undertaking. Do take a galley tour if it's offered, you will be astonished at what it takes to feed a whole ship around the clock. Ships still have Gangways (not gangplanks. That's where pirates walk). They're ramps leading on and off a ship, and they may occur on different decks in different ports. You will always be given instructions. Here's a tip for new-to-cruise guests: when you check in, each guest traveling receives a card key. It's not just to open your stateroom door. Yours also contains your personal identity information. Every guest (and actually, crew too) needs that card every time you Embark and Disembark (get on and get off) the ship. They swipe it at the gangway so the ship maintains their Log (record) of who's on -and who's not on - the ship. When you've reached your final port of disembarkation and your holiday's over, your final card swipe off the ship and travel down the gangway is your final goodbye to your cruise.